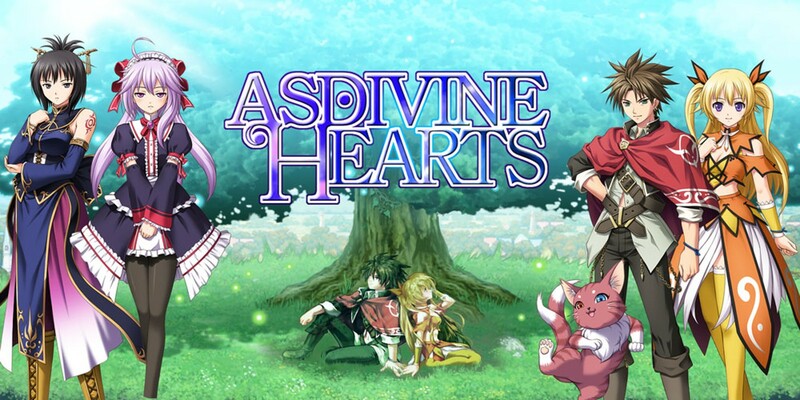 Game Review: Asdivine Hearts (KEMCO; Nintendo Switch) – Ouch That Hertz! Every group of friends has that one guy friend that is always surrounded by females. In college, this was my freshman year’s resident advisor. At first, you may consider having that friend around as a positive, especially in my situation where most of us were Freshmen and me, specifically, as an introvert trying to break out of my shell. As the days, months, and years progress, though, you start getting annoyed while also noticing that the friendships formed between the ladies have an underlying rivalry bubbling underneath. I bring this up, not out of jealousy, but because playing through KEMCO’s Asdivine Hearts was akin to reliving that exact situation. You eventually will lead a party of five that features Zack, the lone male, with three female companions and a tomcat. With that in mind, and KEMCO being known for releasing a ton of budget JRPG mobile games, is this one of theirs you should check out right meow? First and foremost, with KEMCO having a mostly set engine and style for their releases, the biggest differential factors are the story and the characters and their development. As I mentioned above, character-wise we have the naïve hero, Zack, his lifelong friend, Stella; the tomcat who is really the Light Deity but is affectionally known as ‘Felix;’ the High Priestess, Celine, and the mysterious Uriel. Outside of Zack, whom stays pretty one-note throughout (minus a few minor developments), every other main character has spectacular character development. The best character arcs easily goes to Uriel and Felix, with the latter gradually moving from being an unwilling captive in a tomcat body to being a sassy comic relief that still has big dramatic moments…and a growing fondness for fish. Uriel, on the other hand, is a constantly unraveling mystery that really opens up after the mid-game twist the player does not see coming. Speaking of the overall story, the player is given the prologue that one year ago, from the start of the game, the world was enveloped by a brilliant flash of light. Since then, the influence of the Shadow Deity continued to grow, along with the presence of monsters in the world. From there, the story takes a brisk pace (for JRPG standards) through the story and can be completed within 20-35 hours. While the plot falls into some predictable clichés, it overall ends up being enthralling and only gets better as the player hits the mid-game twist. There is an issue where it seems sometimes the Japanese to English translation could have used some work to better get the point across and remove some errors the player may notice. There is also the issue that the soundtrack is dull and generic while also having limited songs to play. These are just minor gripes, though, and does not affect the game greatly. The gameplay is more of a mixed bag for Asdivine Hearts. The player gets a traditional turn-based combat system with various healing, stat altering, and attack items that can be found or bought to be used. What is unique is how the companions each have a Rubik’s Cube that can have different jewels of varying sizes put into them to act as buffs or to expand the companions’ available attacks. I personally really liked this, as it allowed for various changes throughout the game as bigger cubes and better jewels kept being found and made. It kept battles fluid while also allowing me to tinker with builds and play styles. All things considered, the game feels neither too easy, nor too difficult. It is the Goldilocks of game difficulties even with the dungeons feeling unimaginative and designed just to make the player move a lot to potentially trigger a battle. And the player will be moving a lot, as the controls with the analog sticks is not smooth and very wonky most of the time. Sometimes the character will glide further than the player wants or drift away from where it is intended. The inaccurate controls will severely frustrate the player to no end and cause several more battles during unwanted times. Then there is the fact that many times NPCs are supposed to be standing still, and yet the player can see them clearly using the walking motion in place. At least they are staying fit…in a slightly creepy way. Not to mention, that for a company known for mobile JRPGs, the lack of touch controls in the Nintendo Switch version is a strange omission. These touch controls would greatly help the huge quality of life issue found when buying and selling from stores. There are just way too many button presses in these menus since the selection position is on the cancel/back option. In the end, that is just a minor annoyance and one that can be fixed as KEMCO brings over more games to the console and gets better acquainted with the system. Review Copy provided by KEMCO; all games played in handheld mode.